Text of the News Stories Surrounding William's Murder and the Trials. Published and Unpublished Articles Written by Me Regarding My Own Grief and Sense of Loss. regarding the loss of a child and a short story I'd like to believe could come true. I will not listen to that persistent voice of isolation that keeps repeating, "No one cares about me," because deep down inside I realize that everyone I know does. a sixteen year-old homicide victim. William was shot and killed during a robbery at the restaurant where he was on his second day of work. He was sixteen years-old at the time. Here you will find the story of William's life, and death, along with many links and resources for those suffering traumatic and other losses. Information the book written by William's father, Bill Jenkins, following William's death. What to do When the Police Leave is now recognized as one of the most authoritative and informative tools for grieving families and the caregivers who work with them. Bringing a victim's perspective to the insanity and inherent contradictions of irresponsible gun manufacturers, dealers, and owners. Spend 24 hours in my shoes as a victim of gun violence and I guarantee you will never look at guns the same way again. Bill Jenkins is a professional Scenic and Lighting Designer teaching at Dominican University in River Forest, IL. Here are some samples of his work and production designs. As a respected author and speaker, Bill Jenkins has become widely sought after as a workshop presenter, keynote speaker, and training facilitator for police, victim advocates, funeral home personnel, and victims themselves. He is a consultant with the Office of Victims of Crime's Training and Technical Assistance Center (TTAC) which provides financial assistance to programs for training victim service professionals. Click Here for contact information, programs available, and arrangements. by the 30th Street Stage and in Wisconsin by the Rock Players in May 2010.
we are working to develop more interest in the show. Jo and George's otherwise normal life is turned upside down by the tragic and unexpected death of their son, David. Immediately, their ability to function and cope as a family is tested as they go through the grieving process, trying various ways of coping with this loss. Through their grief, they learn a great deal about their personal strengths and weaknesses, as well as coming to grips with this new identity that has been thrust upon them. As their friends struggle gamely to help them, George and Jo work through their grief to get to a "new normal" that will enable them to continue to live with their loss, and yet still find joy and things worth living for. Written by Bill Jenkins, himself having experienced a similar loss, the play explores depths of emotional loss and triumph rarely played onstage. Many will be moved by its honesty, touching humor, and insights. This world premiere production promises to be a powerful evening of theatre that will resonate with the audience long after the play ends. the National Organization of Victim Assistance, Bill Jenkins was awarded the Edith Surgan Award for Victim Activist of the Year. Barnes and Noble Booksellers have informed us that What to Do When the Police Leave will be carried on the shelves of selected stores as well as online. Ask for it where you shop and help us create a demand. Over 22,000 copies of What to Do When the Police Leave have been sold. Not bad for a single title self-publisher selling through word of mouth. A brief feature story of our publishing success is included on the Publishers Marketing Association's website. With a new cover and a Foreword by Patricia Cornwell, this expanded version discusses even more of the issues and information vital to bereaved families. Thanks to Ms. Cornwell and all the fine folks at Cornwell Enterprises for all the help and support. WBJ Press's distributor is In-Sight Books in Oklahoma City, OK. 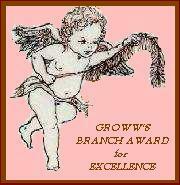 Please contact them for single copy sales and distribution to the book trade and libraries. www.mvfhr.org - Murder Victims Families for Human Rights: An organization comprised of families of murder victims and families of the executed who are working to stop the cycle of revenge and violence inherent in our legal system by working to abolish the death penalty and promote just, reliable, and non-lethal alternatives on an international level. www.fightcrime.org - Fight Crime: Invest in Kids is an organization dedicated to reducing violence in society through meeting the basic needs of children, especially those considered "at risk." www.bradycampaign.org - The Brady Campaign to Prevent Gun Violence and the Million Mom March. Working to bring some reasonable legislation to the gun issue and fight the pro-gun violence/anti-law enforcement/anti-victim sentiment that seems to pervade the issue on the part of those who profit from buying and selling guns. 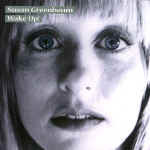 Our friend, Susan Greenbaum (See Below) has several songs, including her latest, Everything But You, the deeply significant One More Angel, and her latest, Angels in America on MP3.com. Click here to go there. Susan Greenbaum's song One More Angel has been released on the Million Mom March compilation CD available from their website . Susan's newest album Hey, Hey, Hey! is out and it's great! Go to www.susangreenbaum.com for more information and a musical preview. The Million Mom March is marching on. "I can't imagine how we let the victims' families carry this burden for the rest of us for so long." An appreciated sentiment. Unfortunately, the arms industry and its supporters have much to lose and are even now declaring war on victims, families, and society with shameless self-serving efforts to bolster a sagging legitimate market. It will be an interesting decade. We will continue efforts to insist that the arms industry begin being responsive to those in society who are affected as we are by its products, not just those who purchase and use them. Now, that's an idea whose time has come. More information on the Million Mom March Foundation is available at their website, www.millionmommarch.com. And a short explanation why I support more effective and rigorous gun legislation. Have you heard singer/songwriter Susan Greenbaum's album, Wake Up!? Her music is a comfort and a joy for us to listen to. Visit our Friends and Supporters page to find out more about this special lady. Her song, One More Angel has topped the MP3 Acoustic charts. Go Susan! An extra special thanks to best selling author Patricia Cornwell for her enthusiastic support of What to do When the Police Leave. If you are visiting from her site, Welcome. Visit our Reviews page to see what people are saying about the book. 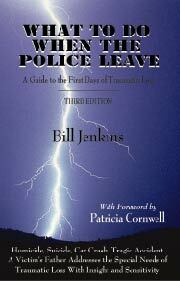 Be sure to visit our unique Online Bibliography and bookstore where you will find all the books listed in the Bibliography of What to do When the Police Leave, as well as additional books and materials useful for bereaved families which have come to our attention since printing. All material on this website is copyright 1999, WBJ Press, except where noted. No part of the text of this website may be copied without permission. Graphics, unless otherwise noted, are in the public domain. may be copied for the personal use and enjoyment of the user. A unique feature in publishing. 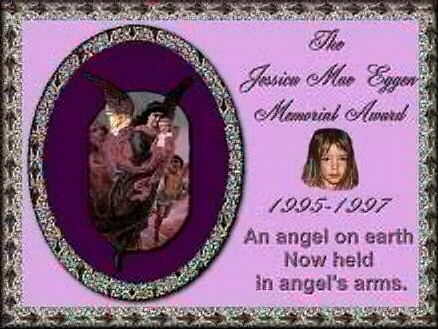 Resources for the bereaved. An Oops or two and some additions for you. Read some of the great reviews we have received. Buy the book here. Bulk discount information.